Escapism, in all its many and manifest forms, must be one of the greatest themes in Sci-Fi and Fantasy literature. From C.S. Lewis’ Narnia series to the Witchworld novels of André Norton many writers have been drawn to tales which turn on the concept (or desire) to leave this Earth and journey elsewhere – usually a fantastical, magical or supernatural elsewhere. Of course it is nothing new to believe that there is something beyond the walls of this world, hidden realms that lie just beyond our perception or just out of reach. Our earliest religions are replete with such other worlds. Indeed in Ireland we have the richest vein of such Otherworldly literature most obviously manifest in the numerous tales of journeys to the Celtic Otherworld, be they the early Eachtraí ‘adventures’ or the later Iomramha ‘voyages’. Here the Irish Otherworld exists primarily beneath the surface of the earth (and seas) and can normally be accessed via ancient burial mounds, caves, under lakes and the sea or more simply through a preternatural mist that envelops some hero and takes him beyond our own world. Later the concept of strange, faraway islands entered Irish literature (primarily adapted from Classical sources) becoming yet another location for the elusive Otherworld of the Celtic Irish. Hardly surprising then that the modern mythologies of Sci-Fi and Fantasy tapped into this rich vein of thought and legend speculating about the existence of parallel or alternative universes (with or without scientific rationales) which could be accessed via devices or portals derived from either magic or some super-science technology. It is a whole subgenre in itself, from Stargates to wardrobes, with endless possibilities and permutations. 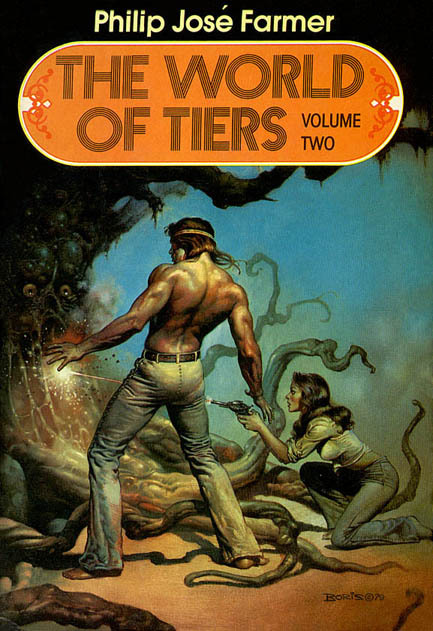 One of the most popular of these transdimensional tales is Philip José Farmer’s World of Tiers stories. Began in 1965 with The Maker of Universes the eventual six books of the series follow the adventures of Robert Wolff, an elderly man from the contemporary United States who abandons home and family to take a journey through a portal to a mysterious and science-defying parallel world. There he participates in a series of high adventures in the grand, over-the-top Startling Stories or Amazing Stories type of way, and eventually comes into his own as he rediscovers his long lost identity, gains lordship of his own miniature artificial universe, and learns the secret history of the Earth. The books are littered with literary, mythological and historical references as well as tying back to other stories and other characters in Farmer’s works. Playing the game of spot-the-reference (and getting them) is part of the joy of reading the entire series. Admittedly the novels frequently betray the era they were written in: a time when men were men and women were women (or so the theory went). However though characters and motivations may be less than rounded at times, the sheer break neck speed and imagination of the stories makes forgiveness of some outdated ideas easily forgiveable. If you can slip your critical faculties into retro mode and let the dubious morality and attitudes of some of the tales slide pass then this old fashioned adventure will be very definitely for you. Wolff is the central character for most of the stories but he shares the platform with the disreputable Kickaha or one Paul Janus Finnegan (yes, red hair and all) who pretty much steals the show (and has been ‘rebranded’ a dozen times by other authors looking for a reader friendly character – Julian May’s anti-hero Aiken Drum has a more than passing resemblance). The last book in the series, 1993’s More Than Fire, is perhaps the least successful of the collection being published some sixteen years after its predecessors when styles and tastes had moved on, and it somewhat jars with the rest of the series but is still worth reading to complete the adventures of Wolfe and the amazing worlds he travels through. Despite their initial popularity, and continued cult following, the books making up the World of Tiers series are hard to find now (either as single editions or in compendium form) but they are well worth hunting down and visiting for yourself.